Reach for the cyanide pills! From the hallow’d pages of the Times Higher comes the shock horror news that one in four new undergraduate courses attracts no students. This is portrayed as some sort of colossal waste of money; universities should have figured out in advance whether there will be a market for their new courses, before they set them up. Unsurprisingly, the study was funded by the Higher Education Funding Council for England (HEFCE). Can one imagine an attitude like that in Silicon Valley? If it had, the likes of Google or Facebook would never have seen the light of day. It is fun to imagine HEFCE as venture capitalists saying: “I’m sorry Mr Page, but the business failure rate for this kind of web site is in excess of 25%”. a time when the ‘new’ universities of the 1960s were devising novel syllabuses, constructed with an eye to the intellectual excitement they generated. Also, the article is not just hand-wringing: he proposes action that the academic community could take in response to the current malaise. Considering whether the UCU should have joined the general strike last week over public-sector pensions, there’s a weak argument in favour and two stronger arguments against. In favour: while it’s true that universities have undergone creeping privatisation over the past few decades (and in a technical sense, never were public-sector in the first place), this process has not been welcomed by most people who have anything to do with universities, most of whom have a public-service ethic. Unfortunately we’ve all been dragged kicking and screaming into a social contract we never signed up for. Under these circumstances, the strike looked like an opportunity to show that we believe in the public-service ethic. The case against: We’re not in the public sector and more importantly, neither is our pension scheme. 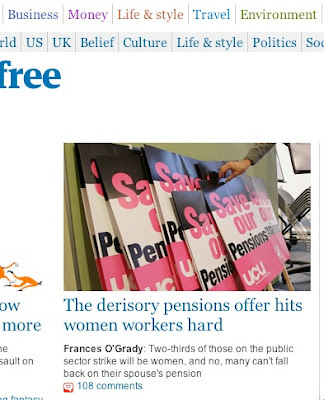 The above clip from a Guardian web page shows UCU placards in defence of better public-sector pensions. Indeed, I saw a few such placards in the flesh last Thursday. The point of using a clip from the Guardian rather than just taking a photo, is that it indicates that the UCU is managing to put about the incorrect message that the universities’ pension scheme (the USS) is a public sector scheme. When asked to select which generation's needs should take priority in terms of sharing the Earth's resources, the majority of people (64%) say that "all future generations" should take priority rather than "my children's generation" (13%), "my generation" (13%) or "my grandchildren's generation" (7%). At least, that’s what we said in response to an opinion poll, along with general agreement that Government policy is too biased towards short-term gratification. But, when push comes to shove, it seems that we go on strike to stitch up a better-paid retirement at the expense of the next generation, who have just been lumbered with unprecedented tuition fees, and a poor job market, and a worsening housing shortage. The “ intergenerational theft” narrative is easy to criticise, but it makes as much sense as the “bankers crashed the economy and made off with ill-gotten gains” narrative. This article at the Intergenerational Foundation describes the problem very effectively. Maybe I’m sensitive to it because, in this story, I’m one of the villains.